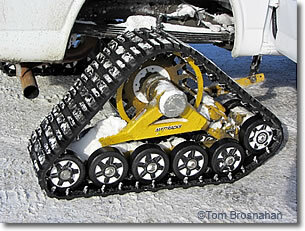 You can't drive up the Mt Washington Auto Road in snow, but you can ride the Snow Coach, a specially-modified van with "tank treads" instead of tires. 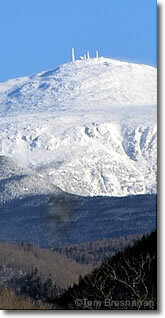 Visitors want to go to the summit of Mount Washington, in New Hampshire's White Mountains, at all times of year. In summer it's easy: hike, ride the Mount Washington Cog Railway, or drive up the Mount Washington Auto Road in your own vehicle or in a tour van (map). But what about going up the mountain in winter? Hiking is dangerous and should be attempted only by experienced winter climbers with proper equipment. The Auto Road is closed to private vehicles, which have little chance of making it to the summit and lots of chances to slide off the road and tumble down the mountainside. 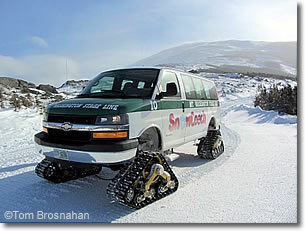 The specially-modified Mount Washington Auto Road Snow Coach vans have continuous tracks, like tanks and bulldozers, and special extra- low gear ratios that usually make it possible to go at least half way up—and, even more important, down—the mountain on the snow-and-ice-covered 7.6-mile (12.23-km) auto road. The views are spectacular! This is how, in winter, you get up there where the air is clear to see New Hampshire—and beyond—from the highest mountain east of the Mississippi. The experienced Snow Coach drivers, men and women, tell you all about the mountain as you rumble along: the weather, climate, wildlife, and the colorful history of the mountain and the auto road. The driver stops several times for passengers to get out (if they wish), experience the howling, sub-freezing winds, and take photographs. Weather and snow conditions may prevent you from going all the way to the summit. (Remember: Mount Washington has the worst, most severe weather in the USA. It would be very expensive, and unnecessary, to clear the auto road of snow and ice at all times—even if it were possible. There is always a turning-point, however, kept clear for the Snow Coach vans to maneuver for descent. Coming down the mountain, Snow Coach drivers rarely apply the brakes. The extra-low gear range is just right for the van to cruise slowly and safely along using engine (compression) braking. up Mount Washington in winter. Below, the "tank treads" that make it possible.